ARTIFACT: This is a pre-World War II Wright Aero Corporation member dues celluloid pin from September 1941. Wright Aero was the aircraft engine manufacturing division of the Curtiss-Wright Corporation. 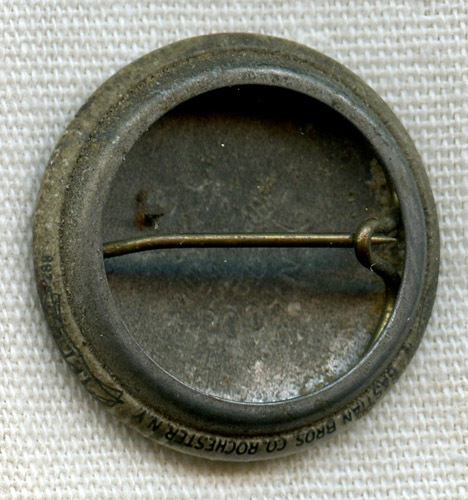 The pin is by Bastian Brothers of Rochester, New York. VINTAGE: Circa September 1941 (just before World War II). ATTACHMENT: Horizontal pin with U-shaped catch. MARKINGS: BASTIAN BROS. CO. ROCHESTER N.Y. on edge; B.B. Co. ROCH. N.Y. on reverse; union marks. CONDITION: 6 (Fine+): The pin has some areas of foxing and some moderate oxidation to the reverse only.